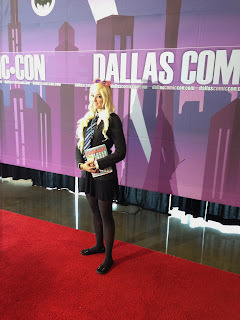 Dallas Fan Days was a few weekends ago, and I still find myself smiling as I look through my photo album from the event! I looked at all the pics and had such a hard time deciding which ones to put in the blog. I wanted to include them all!! So please look at my Facebook Album to see the entire set! 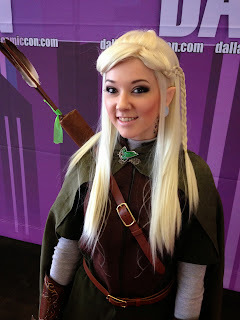 Fan Days is a little smaller compared to Dallas Comic Con which was in May. But this year they made it a three day weekend instead of two. 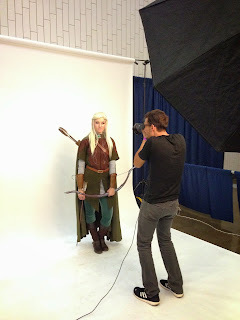 Some of the celebrity guests included Ron Pearlman, John Barrowman, Jon Heder, Katee Sackhoff and Tom Felton! There were also some great comic artists like Neal Adams, Cary Nord, and Mark Reznicek who was also the drummer for the Toadies! These are my friends Scotty and Courtney as Alien vs Predator. Aren't they incredible!! Please like Courtney's page on Facebook to see their other amazing costumes. I always look forward to what they bring to each convention! 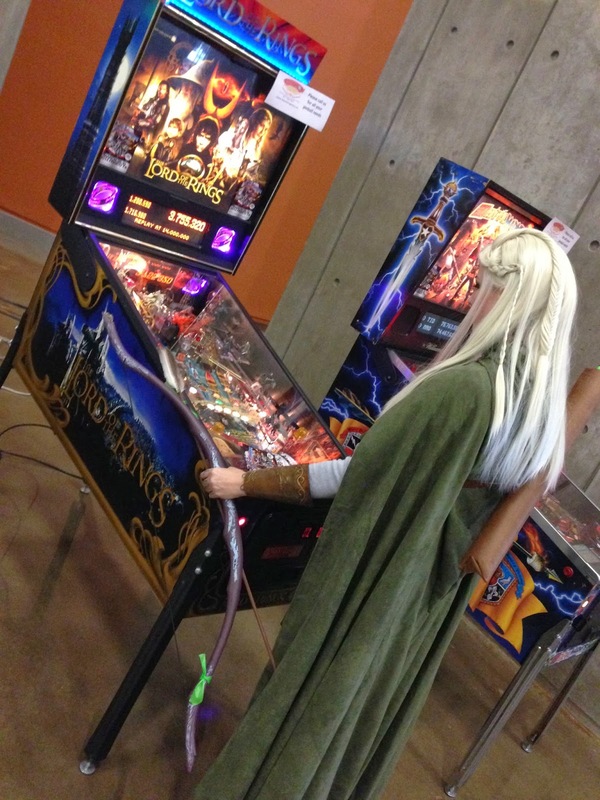 My favorite new addition to the convention was the free pinball area! I had so much fun playing pinball. 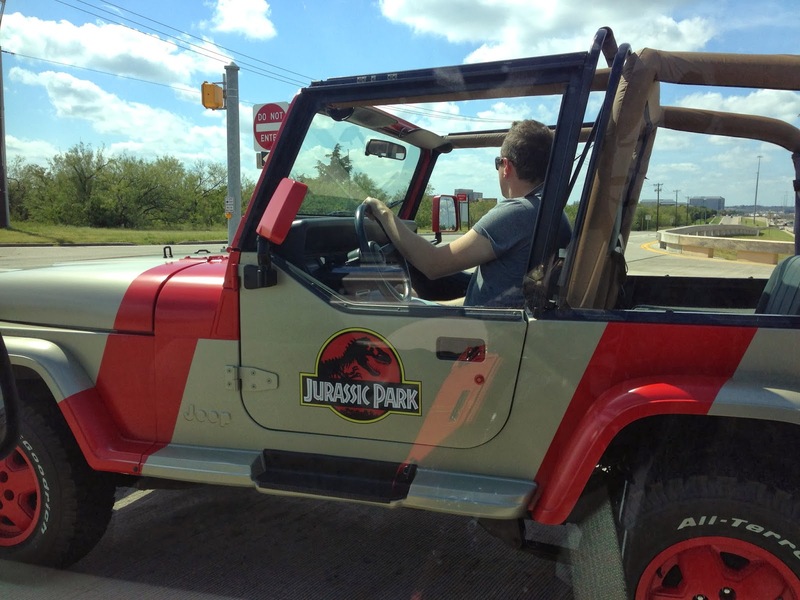 I would love to own one someday. There will be a Texas Pinball Festival in my town on March 28-30 next year! My costume for Friday was Black Widow! My friend Sean of Indel Cosplay was Hawkeye. We had a lot of fun posing with other Marvel characters. This is my good friend Kitty from Aurum Cosplay. She looked fantastic as Rikku from Final Fantasy! I was so happy to see her. 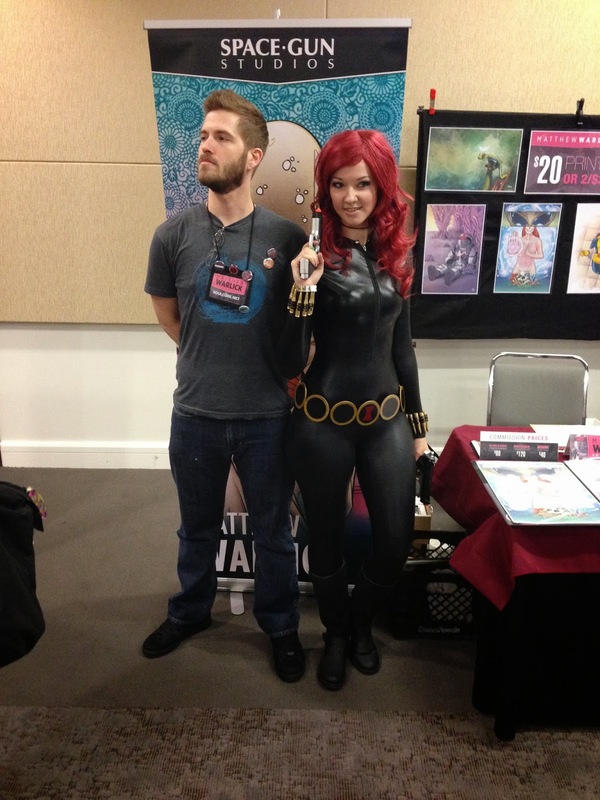 I had to make sure and stop by Matthew Warlick's table in the artist alley to get a picture! 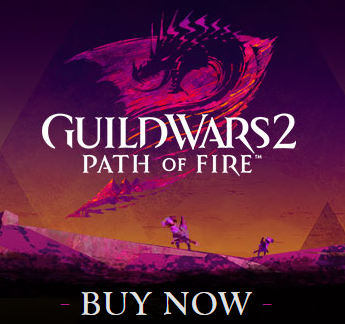 Be sure to check out his artwork! 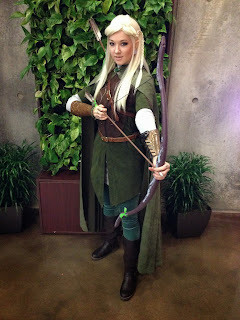 My costume for Saturday was Lady Legolas! I had been working on this since the summer and was so excited to see it all come together. 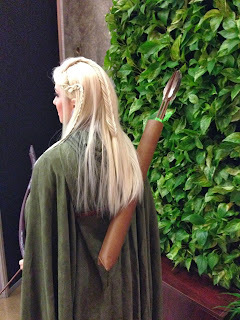 I was especially proud of the wig I styled. I was hoping to wear my real hair, but since mine wasn't quite long enough I decided to go with a wig. I am so glad I did because I feel like it really made the outfit look more fantasy-like. 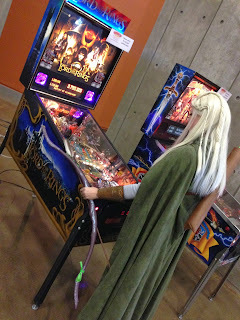 Here I am playing the Lord of The Rings pinball machine! 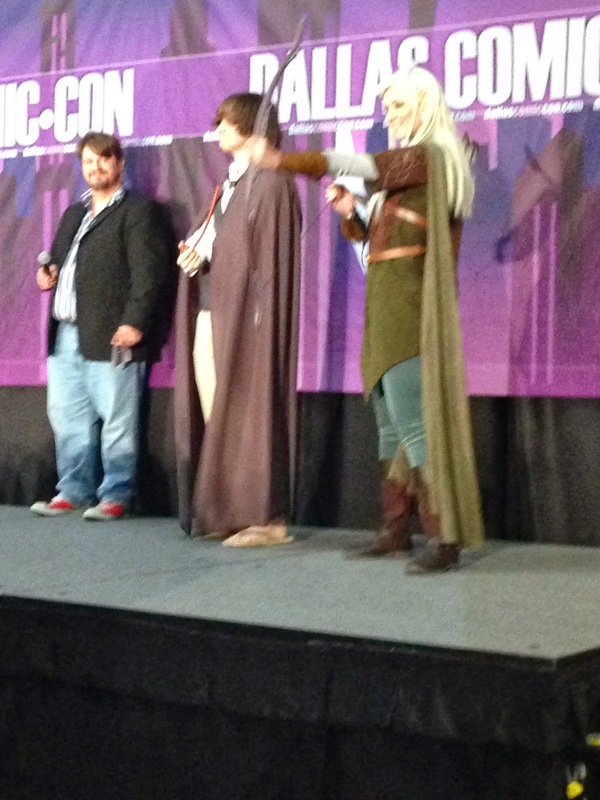 Part of the convention experience is getting some good photos of your costume. I was really excited when I was asked to pose for D Magazine. 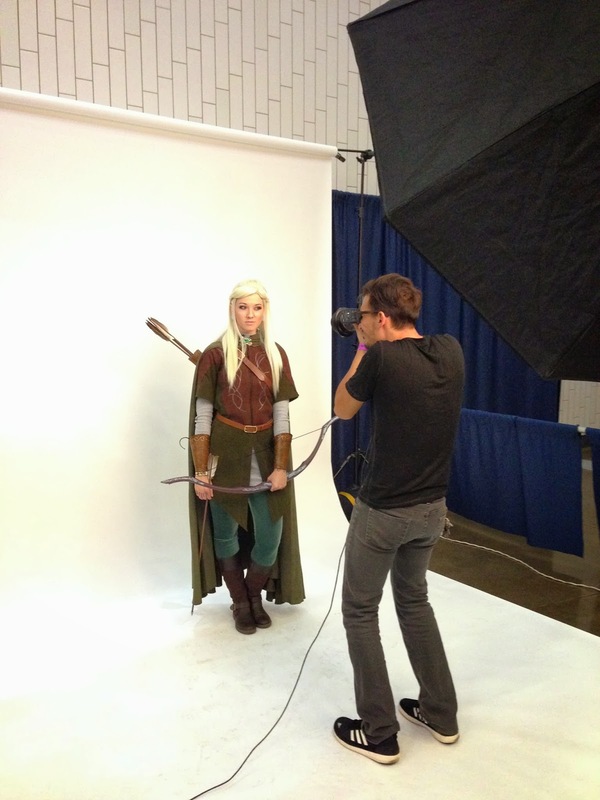 They said the article probably won't be printed until after the new year, but I am looking forward to seeing my Legolas in the popular magazine! 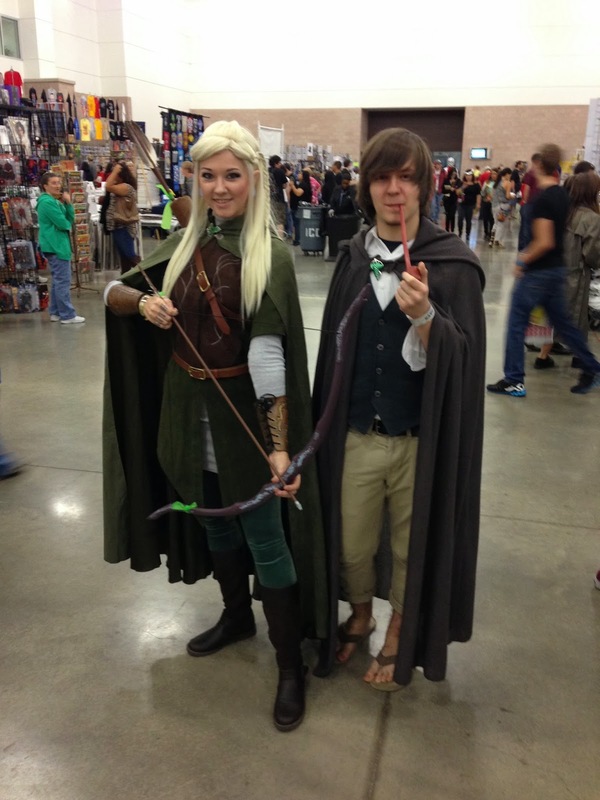 I found this excellent Frodo walking in the dealer's room, and asked him if he'd like to join me in the costume contest! I was debating whether or not I wanted to compete since I get kinda nervous on stage. I felt so much better going on as a team! On Sunday I wore my Luna Lovegood costume. Here I am waiting in line to get my photo taken with Tom Felton! 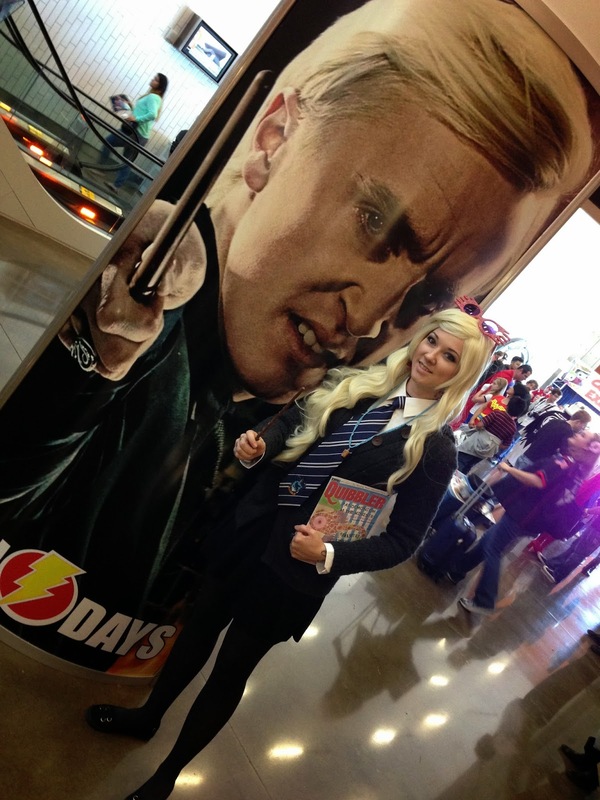 It was great hanging out with other wizards who were just as excited as I was to meet Draco. 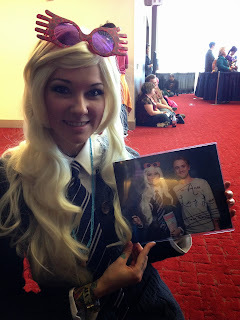 And here is Tom Felton signing my photo of us! He shook my hand and said I looked fantastic! I don't remember what I said to him because I was just SO happy to meet him. He was incredibly nice! I literally had tears in my eyes after getting to meet him. I've never met ANYONE from the Harry Potter series. This was a big achievement to unlock because that is my all time favorite book. This is an interesting crossover - Voldemort and Luna battle at the Stargate! Although I loved my other costumes from the weekend, I probably had the most fun on Sunday. It was my day to really be a fangirl! 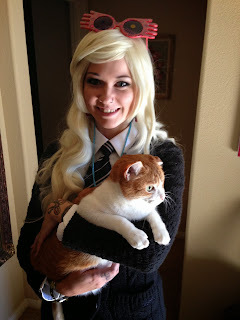 Also, I am pretty sure my patronus would be a one eared kitty. Ahhhh you know Scotty too?! What a small world we live in. I really wanted to make it out to fan days (Borrowman!!!! <3 <3 ) but it just wasn't in our cards. I'm hoping we can pull of SFX though in Feb. There is a Doctor Who con next month that I couldn't get tickets too as well but I'll be missing on that. Your Luna looked fantastic btw! And I'm glad to hear Felton was nice. I've heard mixed reviews on his encounters so I've been holding off on meeting him. Hopefully he'll come around to Dallas again soon! 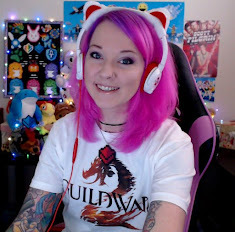 I always enjoy your blog posts! Great coverage! I love the story about deciding to follow the Jurassic Park Jeep! Love your Lady Legolas costume, although all of your costumes have great detail! I love your photos and costumes. 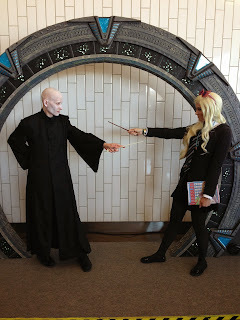 I take great enjoyment when people make high quality cosplay. Love your blog! Perfect styling on the wig! Total props on an amazing Legolas and Luna! Did you use the same wig and curl it? That would be resourceful haha!! Also... one eared kitty! adorable!!!!! All your costumes are amazing. Evanna Lynch was at the con here last weekend. I wish I had enough money to meet her. 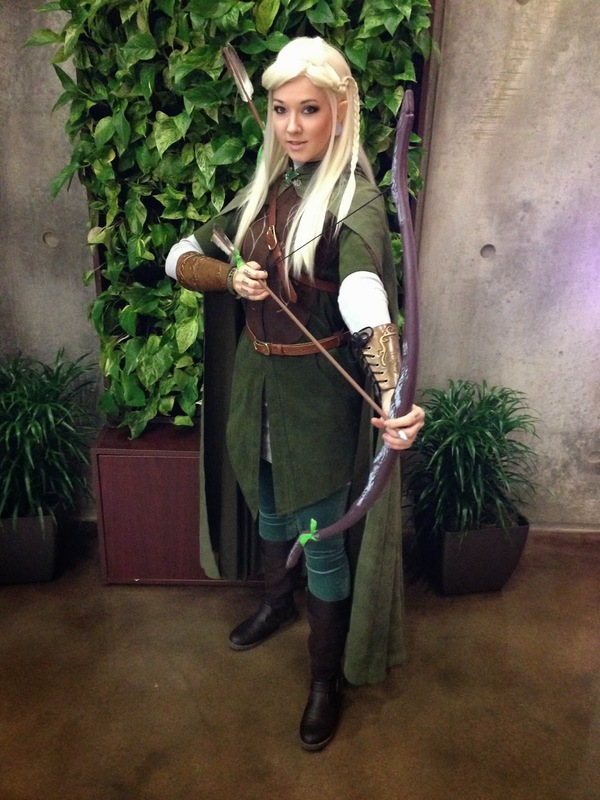 Your Luna cosplay is so rad and It is so awesome to see your finished Legolas. You look so perfect.